Bleeding gums can occur for a multitude of different reasons, but thankfully, there are numerous ways to alleviate the bleeding and lower the chances of further problems. While it is obviously desirable to get immediate relief, you should also seek to find out what the root cause of the problem is, so that it can be treated. 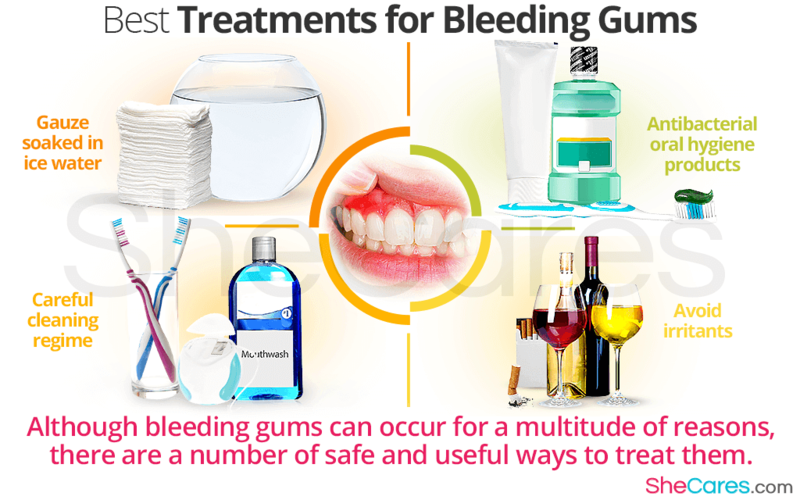 Read on to find out about some of the most successful bleeding gum treatments. To quickly stop bleeding in the gums, you should hold a piece of gauze to the affected area with considerable pressure. If the pad has been soaked in ice water before it is applied, it should provide some pain relief and soothe any inflammation or irritation in the gum. The most effective means of decreasing the chances of bleeding gums is to administer a good oral hygiene regime. Most cases of bleeding gums can be put down to a mild gum infection caused by bacteria on the surface of the teeth. To avoid these, teeth should be brushed at least twice a day, and it is recommended that you regularly floss and use mouthwash. It is possible for rough brushing to lead to bleeding gums, and so you might prefer to use a soft-bristled brush. These are just as capable of thoroughly cleaning your teeth as long as they are used correctly. In addition to practicing good oral care, to lower the likelihood of contracting an infection, it is advisable to use an antibacterial mouthwash. These can be particularly useful if you feel the onset of an infection - for example, if the gums have become slightly inflamed but are not yet bleeding - because they can fight any existing bacteria. If you do have an established infection, using an antibacterial toothpaste or oral gel can also be successful in assuaging it. Many women are unaware that some of their regular lifestyle habits can encourage bleeding of gums. While your mouth will inevitably come into contact with different foods, drinks, and bacteria from other sources every day, some of these are specifically detrimental to oral health, and they can irritate your gums and increase bleeding. Alcohol and tobacco are especially aggravating when you have an oral infection to any degree. Knowing how to treat bleeding gums can be extremely helpful, as the condition can present itself unexpectedly. Whether it is caused by a gum infection or another oral problem, with some understanding about the ways to avoid bleeding gums, hopefully any instances you encounter can be treated quickly and thoroughly. Learn more about bleeding gums.